A new section has just been added to our online Family Bookstore: DNA Testing and Genetic Genealogy. Since an exciting workshop about DNA testing is planned for our upcoming family reunion and numerous requests about this topic have been emailed to me, it was time to include much asked-for books about genetic genealogy to our bookstore! I have read each book (some more then once!) and offered a personal review. No matter if you are a beginner or an avid researcher of genetic genealogy – you will find a book to meet your current questions about DNA testing. Stop by the Family Bookstore today and browse our many selections! Every Amazon purchase helps support this website and our ongoing mission of family research. Click here to go directly to the Genetti Online Family Bookstore. And don’t forget about our DNA Workshop to be held Saturday afternoon, October 8th at the Genetti Family Reunion! Click here to visit our Reunion News page. Or click here to read about our workshop: The Basics of DNA Testing. Since many of the picture postcards are not clearly labeled, I’m using whatever clues I have to identify these ancestral ghosts from the past. When I first received the digital images from Giovanni, I immediately recognized a postcard of my grandfather, Leon Genetti, with his cousin Peter Zambotti. It was also easy to translate the handwritten message on the back of their card, giving positive proof that this was indeed two of my relatives. OK – one postcard identified, nineteen more to go! Browsing through the ancient sepia photos, I looked for more obvious clues – something that easily jumped out at me. 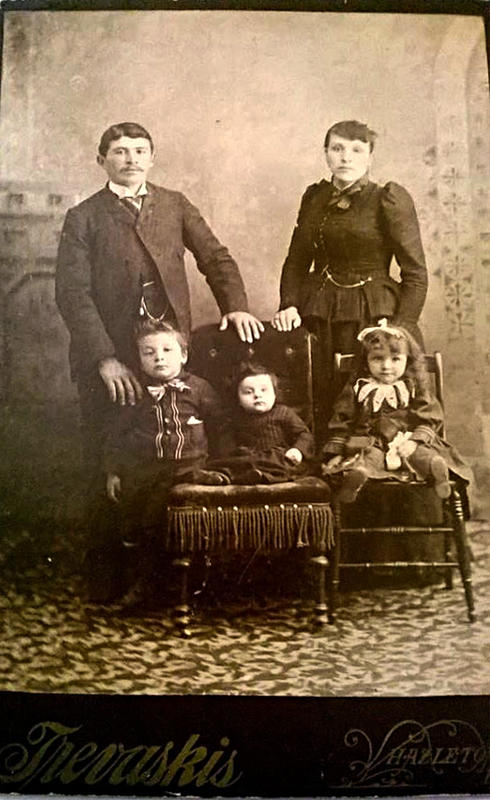 There it was – a portrait of a young family, with the name of the photography studio and its location stamped on front. It said Hazleton! The back of the card offered no identification. But as I examined the photograph, something in the back of my memory clicked in place. The mother, dressed in Victorian black, staring stoically into the camera, looked very familiar. I had seen her before, but where? Then I remembered – she resembled a charcoal drawing sent to me by Don Lingousky of his great-grandmother, Angela Maddalena Genetti Recla. The beautiful portrait had been created by Angela’s adopted son, Henry Parisi Recla. Immediately I went to the Photograph section on our family website and scanned down the page. Eureka! It was a match! Henry had used the original postcard as a model for his drawing. 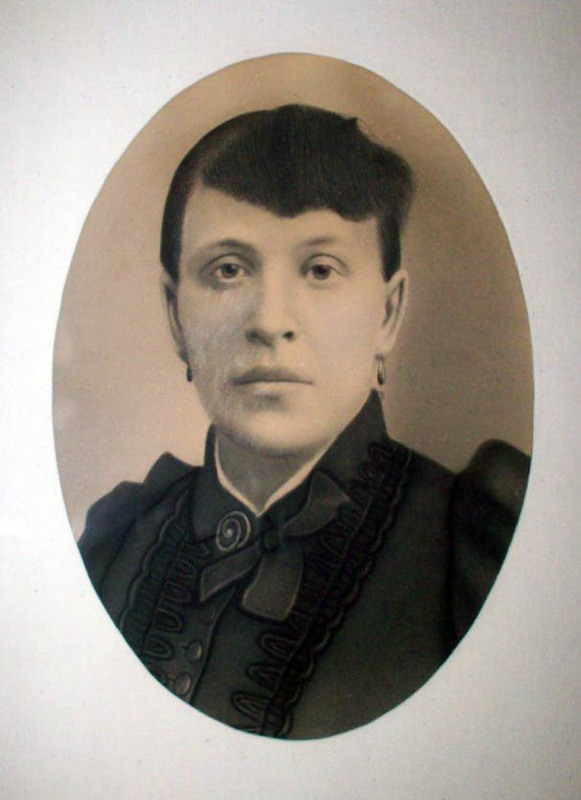 Angeline Maddalena Genetti Recla (1865 – 1937), charcoal portrait by her adopted son, Henry Parisi Recla. Again our sincere thanks to Giovanni Marchetti for rescuing our priceless family memories! Molta grazie! Want to know more about Angeline Maddalena Genetti Recla? A courageous woman and an inspirational ancestor, Angeline’s life will be cameoed in our reunion evening program: The Genetti Family of Castelfondo: Our Journey to America (click here to read about the presentation). And by-the-way, you can meet Angeline’s great-grandson Don in person – he will be co-presenting our DNA workshop during Reunion weekend! See you at the Reunion in October! The details have been finalized! The Genetti Family Reunion 2016 will present a Saturday afternoon workshop about DNA testing and genetic genealogy. This type of program is a first for our family reunion. We’re thrilled to bring you exciting information to help you trace your family roots on a personal level. “The Basics of DNA Testing” is scheduled for Saturday, October 8th from 2:00 pm to 5:00 pm in the Genetti Ballrooms. If you are planning to attend our reunion weekend in Hazleton, Pennsylvania (Oct. 7 – 9), the workshop is included with your reunion reservation. For more info, see the Reunion News! page on the Genetti Family website. You don’t need a PhD to understand the basics of DNA testing. This workshop will present easy-to-understand information constructed specifically for the beginner. Is DNA a mystery to you? Or have you completed a test and now don’t know what to do with it? Louise and Don can offer advice based on their own genetic experiences. Learn about different types of DNA testing, who can be tested and how to use the test results to find cousin matches. We will also discuss recommended companies for DNA testing, pricing, how to order a testing kit and even conduct an on-site autosomal DNA test. Louise and Don (who are 3rd cousins and have matched through Ancestry.com DNA) will share their actual test results and explain how DNA has played a role in their own genetic genealogy research. This is a must-see workshop for every descendant of the Genetti Family! Find out why preserving family DNA is so important and why you need to do it today! Come with questions – Louise and Don will do their best to answer your queries! The workshop is free to all Genetti family members attending the reunion. So make sure you note the time and date in your calendar!